If you think an infant or child is experiencing a medical emergency, call 9-1-1 right away. At McMaster Children’s Hospital, our kids-only emergency department provides the most advanced care for infants, children and youth age 17 and under who have a serious illness or injury. Our team is made up of healthcare professionals who are specially trained in pediatric emergency care. The McMaster Children’s Hospital emergency department is open 24 hours a day, 7 days a week. 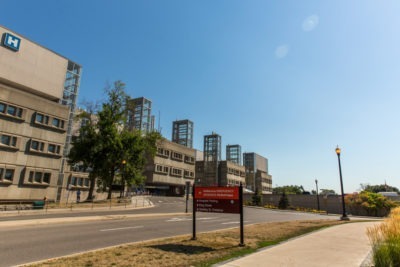 The McMaster Children’s Hospital emergency department is staffed by healthcare providers who are experts in pediatric emergency care. We assess and treat medical issues ranging from minor illnesses and injuries to life-threatening conditions. We treat patients with infections, difficulty breathing, injuries, mental health concerns, seizures, allergic reactions, tummy pain and many other conditions. We also provide our expertise to family doctors and other health centres in our region. In the children’s emergency department, you may meet many different team members, including: emergency doctors and nurses, pharmacists, child life specialists, respiratory therapists, social workers, business clerks, and environmental aids.